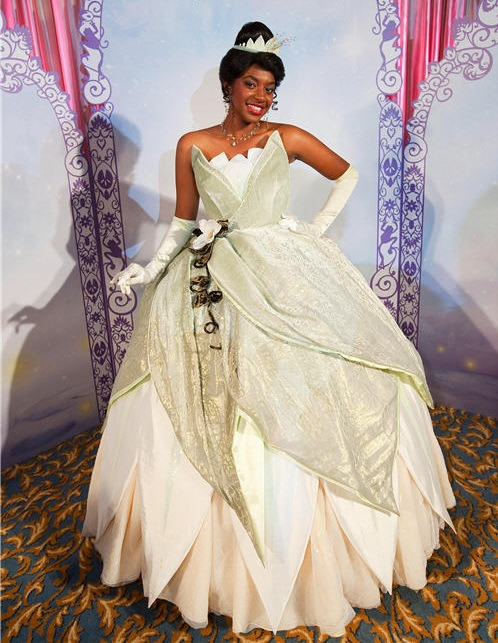 This week's beautiful Disney wedding dress belongs to Tiana from Princess and the Frog! If you haven't seen this movie yet...you're missing out. It's absolutely adorable. It's totally worth being in the Disney princess series. It reminded me of how amazing those movies really are. Also, this is our second to last Disney wedding dress from Alfred Angelo! Who will it be for the grand finale next week? Designer Description: "Honoring Tiana's independence and joie de vivre, this one-shoulder taffeta ball gown features dramatic ruched pick-ups, inspired by the grace of the water lily. The asymmetric draped bodice is embellished with beautiful beaded flowers, metallic embroidery and pearl accents." My Opinion: I think this dress is stunning in its own unique way. I love the one shoulder glittering strap and the bodice. The bottom half I think looks really unique especially in the back. I think the the very bottom trailing on the ground looks like a lily pad! I can see how this was inspired by Tiana. In my opinion it fits her character. 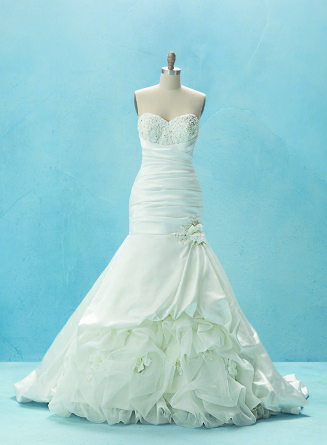 Designer Description: "Brides will dance to the beat of their heart in this Tiana inspired gown. Bold yet romantic, this form fitting, draped satin gown and its organza cloud of dreams skirt is topped off with a lace and crystal sweetheart neckline that sparkles and shines like the Evening Star!!! Both modern and nostalgic, a stylish choice for a magical transformation." My Opinion: I think I like this one more than the first collection, although the first collection reminds me more of Tiana's face character's gown. 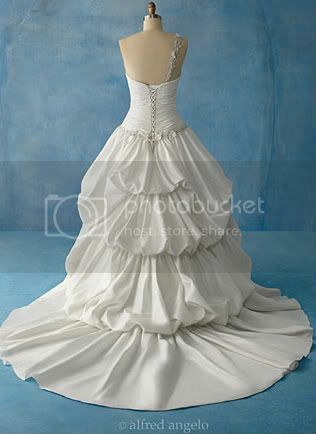 I love the mermaid-esque drop waist and the flowers/leaves in the tulle near the bottom. The bodice is gorgeous as well. All of these dresses were designed by the incredible Alfred Angelo Company!! 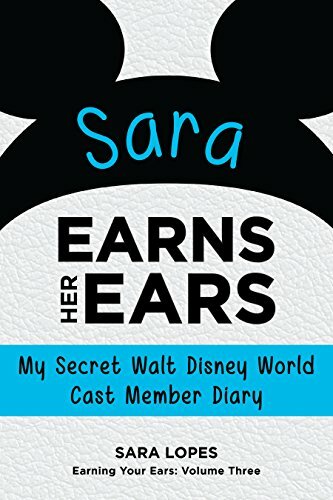 For more updates on all things Disney, subscribe to The Disney Den now! !